Bird Kabobs - Lowest Prices! The Ultimate Shreddable Bird Toy. Natural yucca - 100% safe! Slices and colored discs strung together Bird Kabobs have been described as Catnip for Birds (without the catnip!). All Natural, Earth friendly - 100% biodegradable product. Watch your loved one enjoy chewing like never before. Approx. 13" x 3.5" x 2"
Let your Parakeet, Lovebird, Parrotlet or Cockatiel go to town hallowing out this 9 1/2" chunk of yucca! Lots of activity here! 3" diameter. Easily hangs from the side of the cage. Great for pluckers and overpreeners. 100" biodegradable. Noodle continues to work hard on his toy! Videos courtesy of Mary, from Minnesota, her Noodle, her adorable Parrotlet! The Ultimate Shreddable Bird Toy. Recommended for smaller birds from Parrotlets and Lovebirds to Conures, Caiques, etc. 13" long (toy parts only - length does not include hanging medium). 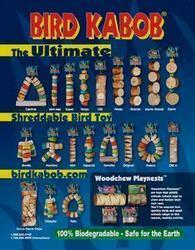 The Ultimate Shreddable Bird Toy Parts! Use for toy making, foot toys and even foraging! These have hundreds of possibilites. 100% natural yucca. The Ultimate Shreddable Bird Toy and Swing all in one! All parts are shreddable!. Recommended for smaller birds from cockatiels to caiques. 4" wide x 7" high. The Ultimate Shreddable Bird Toy and Swing all in one! All parts are shreddable!. Recommended for Conures to Eclectus, Greys & smaller Cockatoos. 9" wide x 7.5" high. The Ultimate Shreddable Bird Toy. Recommended for smaller birds from Parrotlets to Conures. 7" long (toy parts only - length does not include hanging medium). The Ultimate Shreddable Bird Toy. Recommended for smaller to medium birds from Parrotlets to Eclectus. 9" long (toy parts only - length does not include hanging medium). Let your bird have a blast hollowing out the yucca!